2019 Guided Group Bike Ride dates coming soon, please contact us for bespoke guided rides at info@Aviemorebikes.co.uk. 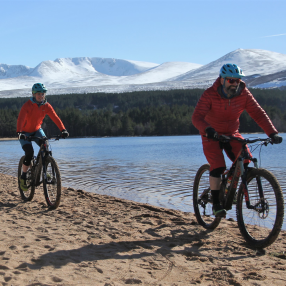 This is a great route for recreational riders, you do not need to be highly skilled on a mountain bike to join us for a ride to Loch Morlich Beach. There will be stunning views on route and the chance to stop for coffee + cake at the Loch. 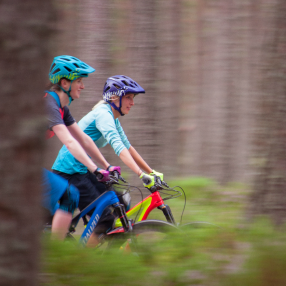 For more advanced riders, warm up with ride to Loch Morlich and then continue on to the famous Green Lochan and then climb further across some rocky terrain to Ryvoan Bothy. Enjoy stunning views and maybe a little snack in the Bothy.ooking be found here – AND E.
Will you spot the Steam Train on route or will you make it along the trail to the Osprey Centre? We will take the Speyside Way which is wide & smooth into Boat of Garten, continue to Loch Garten Osprey Centre or ride back to Aviemore along Route 7. A longer day out around the magnificent Pine Forests. 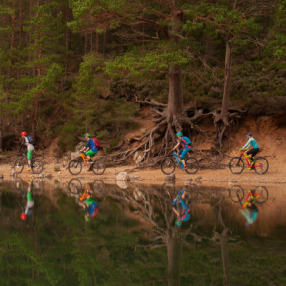 This ride requires a moderate skill/fitness level on a mountain bike, you will ride past the stunning Lochan Mor, Loch an Eilein, Lochan Deo and Loch Morlich. This route is around 45KM. 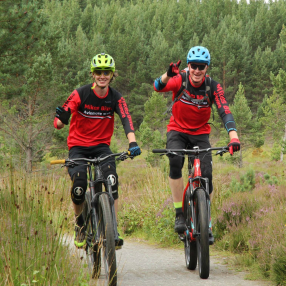 Are you an experienced mountain biker travelling to Aviemore with your own bike? This is the trip for you! 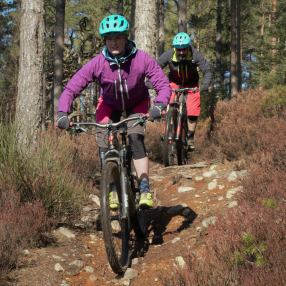 Our guide will take you on a trip around some of the best natural and hidden Singletrack around Aviemore, expect roots, rocks and technical climbs! Been there done that got the T-Shirt? Don’t worry there are plenty of other trails if you don’t fancy one of group rides, just send us an email and we can work out a route for you. And if you do fancy one of the above simply email us – info@aviemorebikes.co.uk. We look forward to riding with you!